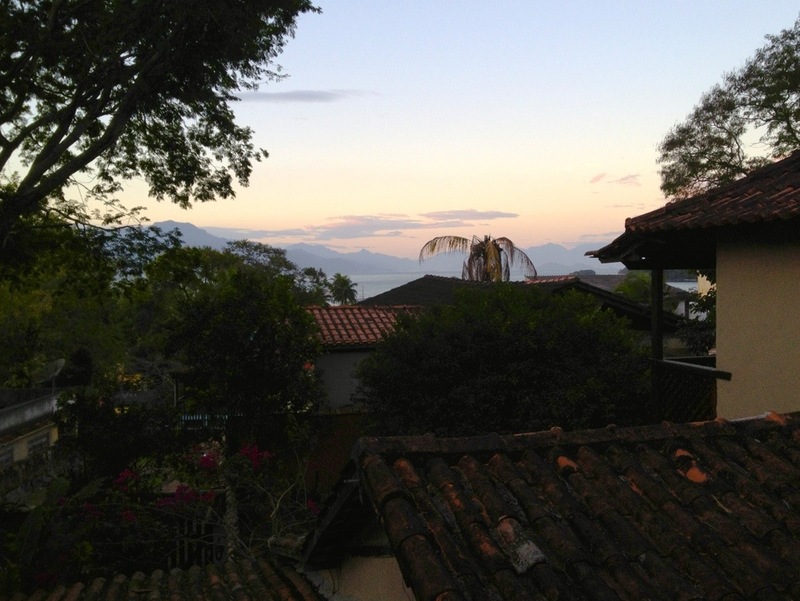 Anyway, yesterday we left our comfortable bungalow of Paraty for the rugged beauty of Ilha Grande. Ilha Grande has only recently become a tourist destination. Up into the mid-1990’s, it was still a penitentiary. Ilha Grande means “big island” in Portuguese, which means the only way to get here is by ferry, catamaran, or schooner. Taking the schooner worked out best for our schedule, but this meant throwing our luggage and ourselves (almost literally) on board. This area doesn’t have the same docking facilities that we do in the US. We left for Ilha Grande onto the beautiful blue-green waters. But we soon learned that the crystal blue waters could also be rather choppy! We proceeded to spend the next 2 hours riding the rough waves, as salt water splashed everywhere. Me, not being a boat person, just hung on for dear life. Thankfully, we made it to Ilha Grande in one piece. While staying here at our pousada, although with quite wonderful service, Ro and I have realized that we’re a little TOO close to nature for comfort. Being among nature means being among LOTS of bugs. But somehow, we’re surviving. Don’t get me wrong, though, it is absolutely gorgeous here. We just have to get used to the fact that we humans are not the only living beings on this island. Now, on to today! Today, we introduced Ro to the Lee Death March – the extreme hike we seem to do every vacation. It was a 6.6 km hike to a beautiful beach (supposedly). This hike took us through the island jungle, up to a great view of the island, and across 2 beaches. It was beautiful! Though humid. My favorite line of the day from my dad: “I’m sweating like Iguacu Falls right now!” Although my parents and I are used to hiking and the San Francisco hills, Floridian Ro is used to flatlands. Needless to say, this was her first, and very well may be her last hike of all time. Her last hike with our family, at least. But we were rewarded at the end with beautiful Praia Lopes Mendes. It’s apparently supposed one of the top 10 beaches of the world. I haven’t been to a lot of beaches, but this does rank as one of my top. It was covered by fine white sand that has the consistency of flour and kind of squeaks when you walk in it. The water was crystal clear, but… cold. Like San Francisco beach water cold. Like feet going numb after 1 minute cold. Thankfully, the 70-80 degree weather on the beach itself made it very easy to warm back up. Oh my! The hike sounds not too bad, except for the heat and the bugs, and the humidity…… But the schooner rides sound absolutely horrifying. (to me at least) I’m so glad you all survived. I’m glad I could take this trip with you via your blog instead of in real life. Is Wanda enjoying the choppy waters and the bugs? Europe should be a nice and relaxing contrast, as will be the convention. phew! I’m just as much as a scaredy cat, too! It’s interesting the things you find about yourself on vacation, for instance, I’ve learned that I really don’t like boats! But, hopefully my last one will be in 15 minutes and turn out ok! Boo’s a trooper. He doesn’t complain, too much. We do have life jackets on the schooners, however I’d prefer to not have to use them! My iPad is finally working with the Internet so now I have some photos up! Miss you!